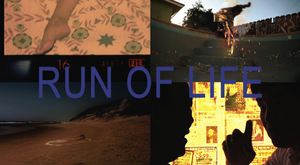 Nightingale Cinema’s Christy LeMaster and Kartemquin Film’s Beckie Stocchetti join forces to present RUN OF LIFE, a co-curated experimental documentary and expanded media event running every third Monday. This new series pairs a recent feature experimental documentary with a short nonfiction work in any number of mediums – performance, video short, interactive presentation, audio doc, etc. Featuring excerpts form Your Day is My Night with a special focus on our beloved wedding singer Yun Xiu Huang. 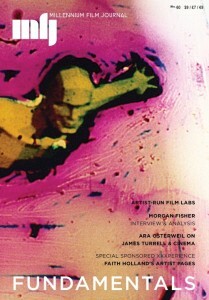 An interview with director Lynne Sachs is also included. 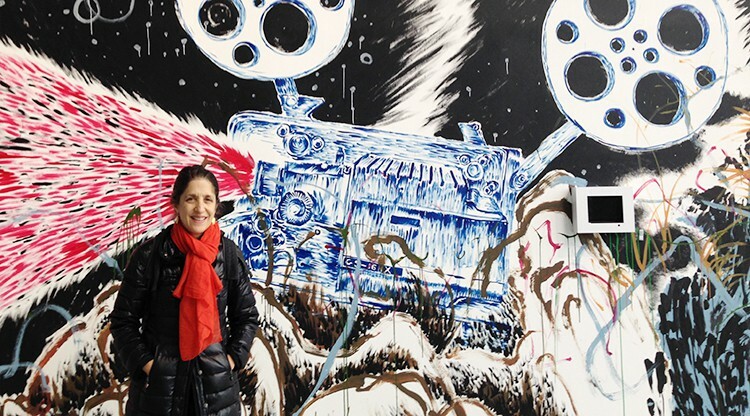 Sachs, who is also known for incorporating poetry, collage, and painting as well as dramatic performance in her films, continued to explore and develop this approach over the course of 25 works, including her latest, Your Day is My Night (2013), a hybrid documentary about residents in shift-bed apartments, a virtually unknown phenomenon of New York’s Chinatown. Like her previous films The Last Happy Day, a portrait of her distant cousin who survived the Holocaust, and Wind in Our Hair, a loose adaptation of a Julio Cortázar story, the film weaves in fiction elements—some are jarring, others are so seamless they’re hard to pinpoint. The film is especially notable for the unexpectedly personal monologues the residents of this insular community deliver, which are based upon her interviews with them. How an outsider got a group used to staying out of the public eye to open up is largely the subject of our conversation. Karen Rester (Rail): Let’s start off with the Uncle Bob story that launched you on this project. Turns out a hotbed house is where workers, and, in this case, people who worked on the docks in Brooklyn, shared beds. One person was on the night shift, one person was on the day shift, and that really sparked my imagination as a platform or a location. Then I discovered that these shift-bed houses—which is another name for them—still exist in Chinatown today. That’s what led me to the Lin Sing Association, where I met the group of older Chinese immigrants who would collaborate with me on the film. 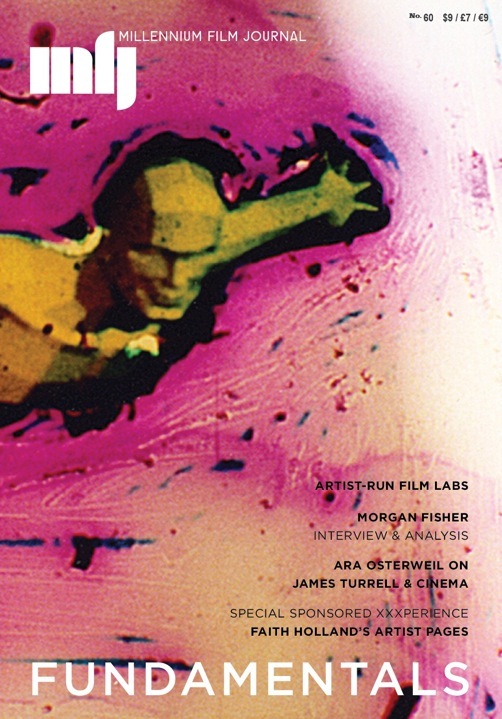 Rail: And, as you told me, you asked some of them this one great question, about beds, that led to some of the most intimate stories in your film. Sachs: It wasn’t a clever question at all. It was just what I needed to ask: Can you tell me anything interesting that ever happened to you in a bed? ​I thought they would tell me something like, “When I first came to the United States I lived in a room with eight people. Let me tell you, it was hard.” Instead, they were the ones who opened it up to stories that were very personal, very revealing of the larger story of Chinese history and Chinese immigration. It went from one Chinese man telling me about living on a mattress in a closet in Chinatown for three months to another woman talking about lying in bed and dreaming about the father she never really knew. That question sparked their imagination. That’s a key to documentary for me. When you can work with the people in your film and get them to harness their own imagination. Rail: I think I mentioned I’ve been recording interviews with some Chinese relatives in the Mississippi Delta, and even being a member of the community it’s not easy getting them to open up. So when I saw your film the first thing that came to mind was, how in the world did a non-Mandarin speaking white woman get them to reveal some of their most intimate details on camera? Sachs: [Laughs.] I think one of the keys to working in reality and working with people is allowing the extraordinary to appear familiar rather than exotic. If you immediately respond, “Oh that is so heavy!” then you’ve introduced a level of intimidation. So if someone was telling me how during the Cultural Revolution his father was beaten to death by a group of farmers, I’d say, how did you feel about that as a child? If you didn’t have any food what did you eat? I tried not to make these issues, which have this mythic horror, seem that big, because then it becomes scary to talk about them. So I’d guide them to revisit these moments in the most vivid way possible, not as a symbolic event in the history of China. Rail: This isn’t your first film about beds. You made Transient Box in the early ’90s. I understand you, camera in hand, asked your now–husband, Mark, whom you’d only known for a few weeks, to accompany you to a motel room and remove his clothes? Sachs: [Laughs.] I wanted to film the marks a man leaves on the bed and in the room, but I wanted him to remain invisible. All the detritus that people want to erase, the pieces of yourself that you leave behind, are interesting to me. Of course in your own bed you can leave as much as you want and people aren’t going to sweep it away. That’s what intrigued me about these shift-beds. People aren’t able to leave an imprint of themselves and that became very unsettling to me. Rail: The British artist Tracey Emin once did a controversial installation called My Bed. She took her bed, which she’d been sleeping in when she was depressed, and put it in the Tate. It was blood-stained and there were condoms around it. Sachs: That’s exactly what would never happen in a shift-bed apartment. You wouldn’t leave that detritus because that’s saying, “This is mine.” By erasing your presence you’re inviting another person to establish theirs. Rail: How did you see Chinatown before and after the making of this film? Sachs: Before I made the film, Chinatown was a place to feel out of place. A place in New York where you had the sense you were in another country. I’m really interested in this French word dépaysé, to be out of your country. It also means to be disoriented. I like the idea that when you go into another community you have this sensation of being an outsider. And for most people so much of it is about gratification. You feed your eyes. You feed your mouth. Sachs: Exactly. It’s almost as if I never looked up. Now I look up and I can imagine looking in. And I have friends to visit. Rail: I’m half-Chinese and Chinatown is a foreign place to me, though seeing your film helped change that. I think movies have trained me to think of Chinatown as background or an exotic setting where the protagonist chases the bad guy through a maze of crowded streets. Sachs: You never know how a film will draw open curtains on various worlds for audiences. There’s the New York City audience that sometimes responds, “Oh, you’ve forever changed the way I walk into Chinatown.” And maybe not just Chinatown, but any place where you feel you are benefitting from its differentness. Then there’s the audience made up of young Chinese immigrants who say the film harkens back to a time in Chinese life that was closer to their grandparents. Rail: At least two of your performers have lived in New York since the, 60s. They’d never been to the Metropolitan Museum of Art until you took them there. What inspired you to do that? Sachs: One of the things I tried to do was take them out of their comfort zone. I think this is what creates unpredictable, almost theatrical situations. We went to the Met to see two things. The first was an exhibit called The Emperor’s Private Paradise: Treasures from the Forbidden City. It was a simulation of a grand palace in China in which the emperor created different seasons in different rooms. So if it was winter outside and he wanted to be in spring time, he would go to the Spring Room. I just love that idea because it’s the antithesis of living in a shift-bed house, where you have such little control over your environment. Then I took them to the 20th century wing to see Andy Warhol’s floor-to-ceiling portrait of Mao Tse Tung. I actually wanted to trigger something, I wanted to rock everyone’s world. I thought, big things are going to happen! We get there and they really couldn’t have cared less. Rail: [Laughs.] Let’s talk about the wall you hit during the editing process. The film suffered from a dramatic storyline you couldn’t make work. People didn’t like it, you were devastated, and you didn’t know what to do. Sachs: Mark actually said to me, “Stop sitting in front of your computer editing, editing, editing, and not going anywhere—it’s getting worse!” [Laughs.] Then, out of the blue, someone sent me an email about an abandoned hospital in Greenpoint looking for artists to put on performances. So I called everybody up and said, “Let’s do our show live, I’ll bring two beds.” We did it again in the Chinatown public library. 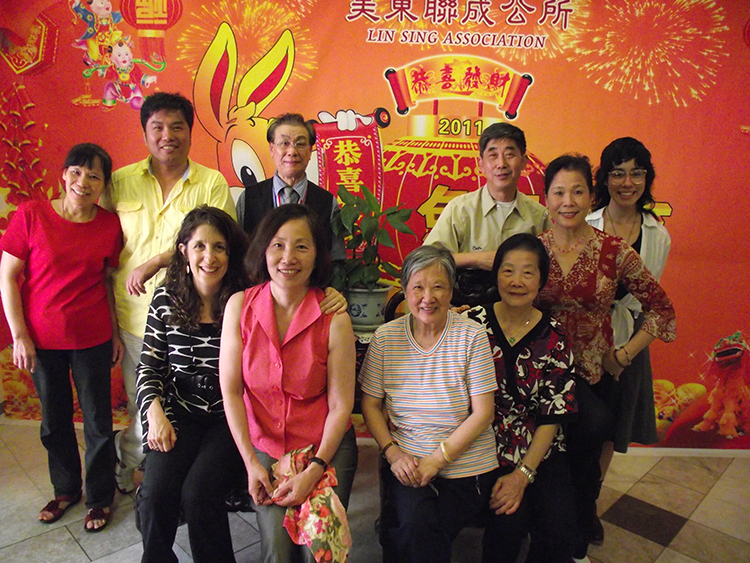 Then at University Settlement, a community center in the Lower East Side. I grew to love the performance more and more, and saw it as a way to lay bare the structure of the film. Rail: Did that help you finish it? Sachs: Enormously. Especially with the transitions. Once you listen to these really intense monologues you can’t just move onto something else that quickly. Where do I take the viewer afterwards? I realized I could integrate scenes we recorded from the performances as transitional places where people could meditate on what they heard. Rail: By the way, I misinterpreted your title. I realize now it’s dialogue between two people sharing a shift-bed. One has the day shift, the other has the night shift. How did you come up with it? Sachs: I knew the film was called Your Day is My Night before I even started shooting. It’s a little bit of a tribute to Truffaut’s Day for Night and also, the history of narrative filmmaking where if you needed day but were shooting at night you just created it. It’s sort of like the Forbidden City where the emperor had so much power that he could create seasons. The hegemony of everything. I’ve always resisted that in my filmmaking. I didn’t want to be a director per se; I wanted to be a filmmaker who didn’t work in such hierarchical situations. 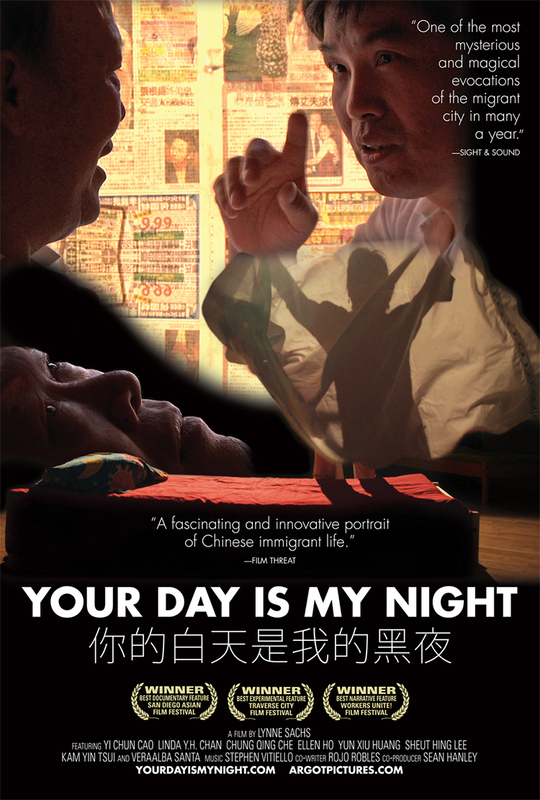 On July 15, The DocYard series, running Monday nights at the Brattle Theatre, will host writer-director Lynne Sachs and her gorgeous, intimate look inside one very crowded New York Chinatown apartment, Your Day Is My Night. 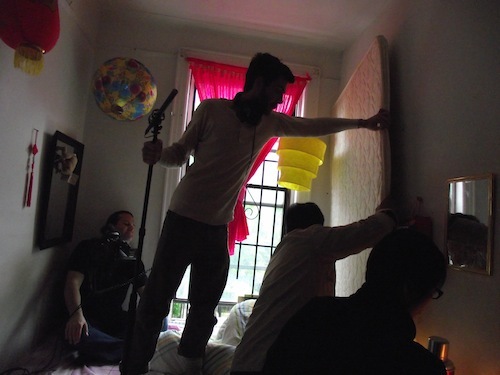 The film examines the phenomenon of “shift beds,” an accommodation between someone who works during the day and someone who works at night, when neither can afford their own apartment. Or, as a singer-for-hire who uses one of the mattresses puts it, “Moon, working. Sun, sleeping.” And vice-versa for his counterpart. 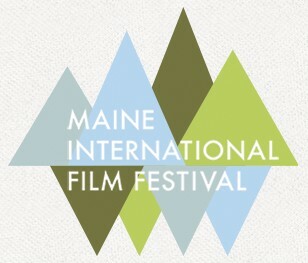 Sachs calls the film a “hybrid documentary,” with real-life stories told by middle-aged and elderly, Chinese immigrants presented in a honed, often theatrical, style rather than as verité oral histories. Your Day Is My Night was produced for the stage before it was made into a movie. 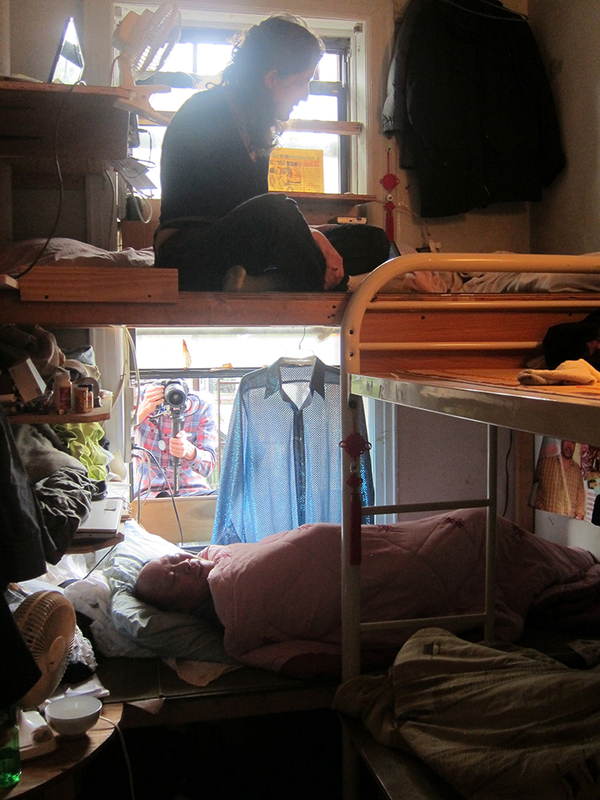 The seven Mandarin and Cantonese speakers who play inhabitants of the apartment and its tiny bedrooms are non-actors or Chinese folk-arts performers. The opening frames do what a stage show could never do: make an extreme close-up of an elderly, Chinese woman’s profile suggest a formidable landscape. 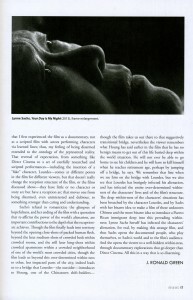 After situating the viewer within the apartment by focusing on everyday objects, the film lets its subjects spin stories of the present and the past. In their adopted country, they share closet-like bedrooms, stuffed with twin beds, bunk-beds, and mattresses on the floor. 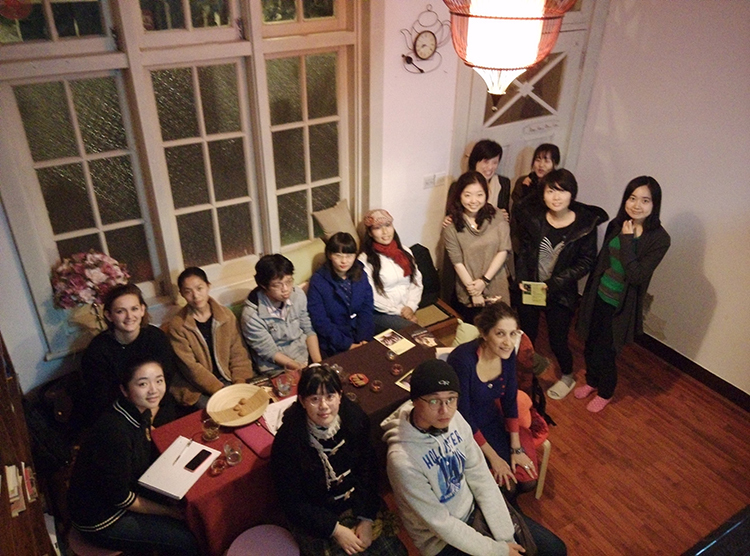 They watch the seasons pass and celebrate traditional Chinese holidays. The stories of their youth in China are more volatile: reminiscences of beds they have known and shared with family members lead to revelations of death and displacement generated by the Communist revolution. These tragedies feel like a brutal rousing from a lovely sleep. For some, there was never a lovely sleep. A sad-eyed man recounts how his family followed Chiang Kai-shek to Taiwan in 1949, leaving him on the Mainland. They said they would come back for him. They never did. Spending time with this interdependent community makes one recognize new meanings in small actions. A fresh, new pillowcase ceases to be merely a fresh, new pillowcase: the act of placing it over a pillow becomes a gesture of respect.